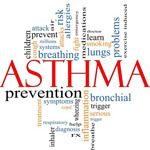 (HealthDay News) -- An asthma attack can be triggered by a host of factors, from things to which you're allergic to panic or fear. Respiratory infections such as the flu or common cold. Foods to which you're allergic, commonly shellfish or peanuts. Medications, such as nonsteroidal anti-inflammatory drugs. Allergens, such as smoke, dust mites, mold or animal dander. Pollen, air pollution or significant changes in weather and temperature. Stress, laughing, crying, yelling, or feeling afraid or angry. Irritants from strong odors, such as from cleaning supplies, air fresheners or perfumes. Exercise, such as from climbing stairs, playing sports or swimming.